My first foray into Strategy Role Playing Game (SRPG) was Vandal Hearts for the Playstation console. I loved how the characters can move about a 3D terrain, making skill, strategy, and strength work together to win the battle an exciting challenge. After Vandal Hearts, I tried Final Fantasy Tactics. It was one deep and engaging game, one that I truly loved. Why, even my nieces played Tactics. I think they even played it twice! Ummm... I did too, actually. So why play it again on the PSP? Well, actually I had been delaying playing this game because aside from the gorgeous animation that's new to this remake, what else is there? So I settled for Jean d' Arc. But that was over with too soon, and I was back to Tactics. Man, this game still has it! And whereas I had relied before on leveling-up Monks, Mages, and Dragoons, I am now going for Samurais, Ninjas, and Bards. I have been playing this game for over 54 hours now and I still see a lot of satisfying gameplay ahead. A colleague and I had been doing multiplayer melees and rendezvous battles as well and it's sweet! Works well. The cooperative mode is especially challenging with its leveled-up opponents. 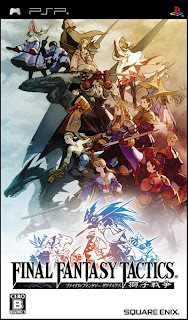 Final Fantasy Tactics is truly one of the best SRPG games around.